Crafted in classic 9ct gold, these distinctive heart-shaped drop earrings feature intricate cutout detailing for an eye-catching finish. Wear alone for understated glamour, or team with coordinating accessories for maximum impact. 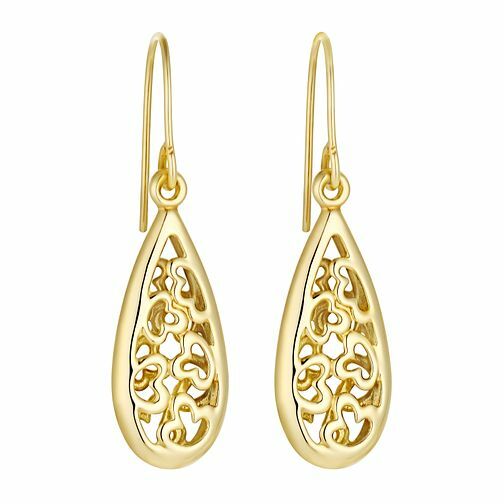 9ct yellow gold heart cutout teardrop drop earrings is rated 4.0 out of 5 by 1. Rated 4 out of 5 by Anonymous from Lovely earrings Bought as a Christmas present so haven't given them yet. Arrived in good time, we're packaged securely and as described in the website. Only downside is the wrapping service, given that the typed message was merry Christmas I was disappointed that the wrapping was dull and not festive at all. A ribbon was sent on elastic that doesn't fit the parcel. Not worth paying for the service as had to buy my own gift bag and ribbons. Otherwise I would recommend the product and jeweller.